Autism in Paradise: Who Should Be the Voice for Autism?? Who Should Be the Voice for Autism?? I have read a number of blogs or comments to blogs written by self-advocates. Often these individuals were not even diagnosed until adulthood and have successful careers, but the diagnosis helps them to better understand themselves and why they always felt different. Others are less successful in their professional and personal lives and seem to want to label themselves as autistic, as if this is the only thing that defines them, and society's lack of understanding is what is holding them back. I read a hate-filled comment on a blogger's site that began with, "I am autism" and proceeded to excoriate the parent who is trying to improve her child's condition. So here’s the thing…autism is not a nationality, it is not an ethnicity or gender. It is a neurological disorder often accompanied by medical conditions that severely impairs many who have it. Those individuals who are able to write an eloquent piece are not in the same category as those children we are struggling to help. Most self-advocates are high-functioning and believe autism “doesn’t need a cure”, as if everyone experiences autism as they do. They mock parents who want to ameliorate or eliminate their child’s autism. They write things saying we parents want to rid the world of autistic people because we want to treat our children’s condition. The irony is, many of these high-functioning people are that way because their parents stood behind them and helped them achieve the success they have. 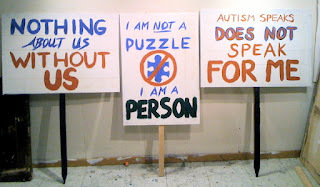 They also say things like Autism Speaks is trying to find genetic markers so autistic children can be aborted, and therefore, never born…they show up to legislative hearings to testify against bills to require health insurance coverage for autism treatments because they believe autism is a natural expression of the human genome. I find this line of reasoning fault, to say the least and damaging at worst as it can perpetuate the myth that all autistic people are intellectuals who do not want to be changed. I am concerned the voices of the self-advocacy crowd and especially their abilities will obscure the very real crisis of autism as we parents live it—children in pain with a very real health condition. I fear people will see Aspies like Ari Ne’eman, president of the Autistic Self Advocacy Network (ASAN) and a presidential appointee on the Council on Disability and categorize autism in this way…highly intelligent, well-spoken and accomplished and this will diminish the message that autism is a national crisis. Ari writes on the ASAN website, “Thank You! Congress Got the Message: Nothing About Us, Without Us!” I’m glad Ari was able to testify, but many of our children cannot speak, much less provide testimony to a Congressional Committee. When a high-functioning autistic person testifies, this becomes the public view of autism. Severely affected persons are not able to present their side. And it’s almost as if having an Asperger’s diagnosis has become in vogue, bestowing an elite status. I frequently see the retroactive diagnosis of historical figures with Asperger’s. 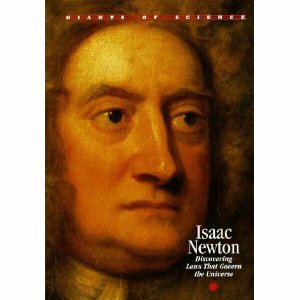 I just read where gifted 17th century scientist Sir Isaac Newton, along with Thomas Jefferson, Albert Einstein, Vincent Van Gogh, Mozart, Charles Darwin, and Michelangelo (born in 1475) are now speculated to have had Asperger’s by some folks in the neurodiversity crowd. Being a genius, eccentric and not particularly social does not mean you have Asperger’s or autism. This speculation is ill-founded and serves as evidence to some that autism was always with us in these numbers. It was not. It also feeds misconceptions by society that all people with autism are in some way gifted. 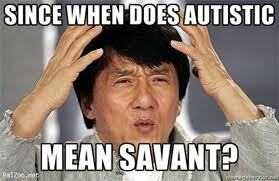 The other night I was asked in what area my youngest son is a savant. I had to explain that he cannot speak and his team is working hard to teach him basic life skills because his communication circuitry is broken. 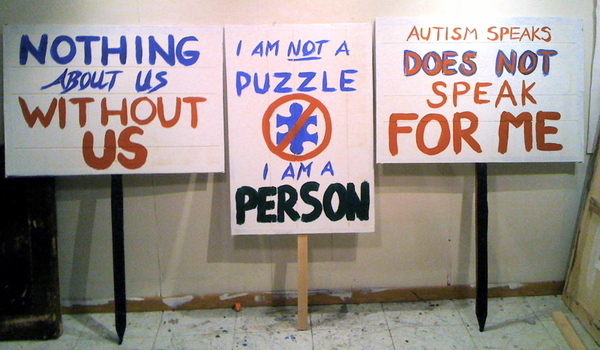 No one should be ashamed to have Asperger’s, or any form of autism. But autism is not an exclusive club you belong to. It does not usually endow its recipients with special gifts and frankly is typically quite the opposite. I hope one day Ryan can advocate for himself and other people with autism…but as it stands now, I will have to be his voice. And if that day never comes, that is OK, too but I will never stop trying to help him. So who should be the voice for autism? This should not be an either-or argument. People with mild forms of autism, such as Asperger’s need support, too and I have my feet firmly planted in both camps because I have children on both ends of the spectrum. But I am also realistic enough to realize my high-functioning son does not have the same—or degree of—need that my severely afflicted son does. I think all of us in some way impacted by autism have a role, but we should be respectful of one another. A parent trying to improve their child’s quality of life and put him or her on a path to independence is not being disrespectful to autistic people. Having autism does not give you the right to vilify parents and providers trying to put children on a path to independence and it does not mean you have the final word on the subject. Just as there is diversity in the autism spectrum, there is a diversity of need that must be recognized. If Autism Speaks and the like can stop trying to actively silence Autistic adults, maybe we can. Thank you for your comment. I don't think anyone is trying to silence autistic adults, and no one I know believes there should be only one voice for autism. But high-functioning individuals do not experience the worst of autism and make statements that imply it really isn't so bad at all--perhaps because that's the way they experience it. My son with Asperger's is handsome, brilliant and an all-around awesome person who is an expert in military history and has recently discovered an interest in philosophy. He'll go far in life--he has suffered no tragedy. However, Ryan has. He has a health crisis that completely affects his quality of life. He cannot tell us when he is sick or when he has hurt himself. He has an auto-immune disorder and digestive problems that cause him pain. He is allergic to every food he's been tested for--over 180, including garlic and cinnamon. Feeding him without him suffering allergic reactions is difficult. What parent wouldn't want to alleviate their child's suffering? And it is suffering--physical and mental.I hope one day he'll be able to engage in debates about autism, but I don't believe it is likely. I don't understand that why people judge the person suffering from autism. He is not a puzzle. He is also a human being and everyone must understand his nature and give him the kind of atmosphere he needed. You do realise that all low-functioning means is Autism + Intellectual Disability, right?